To tackle the climate crisis rich countries, including Scotland, must step up climate action now. That’s why we’re campaigning to improve Scotland’s new climate law to deliver urgent and real action. We know that climate change is affecting people today. Communities are already experiencing the impacts of man-made climate change, especially in the Global South, but also increasingly here in Europe. Those least responsible for causing climate change are harmed first and worst. Friends of the Earth believes that European and other rich industrialised countries who are most responsible for causing climate change, must do their fair share to act first and fastest to combat climate change in ways that do not deepen social injustice. Scotland must play its part. The science is clear. To limit global warming we need urgent action in the next decade. But the Scottish Government’s draft climate law, published in May 2018, kicks climate action into the long grass and pushes the burden for tackling climate change onto future generations. We’re working to ensure the new Climate Change Act delivers our fair share of global greenhouse gas cuts, and builds a just transition towards a fairer, healthier, zero-carbon Scotland. To set Scotland on a path consistent with the Paris Agreement aims of keeping global warming below 2ºC, and preferably to 1.5C, we need stronger targets, together with new policies to deliver rapid emissions cuts. What does Scotland need to do? June 2017 – Scottish Government published proposals for the new Climate Bill. The government had chosen not to listen to the science, and proposed to do almost nothing extra to tackle climate change between now and 2030. Summer 2017 – Almost 20,000 people responded to the government consultation, 99% of whom called for stronger targets and more climate action! Read our response. May 2018 – The draft Climate Change Bill was published, but there’s a lot to improve! Autumn 2018 – Scottish Parliament Environment & Climate Change committee start their inquiry into the draft law. What have we won so far? They pledged to phase out the sale of new fossil fuelled vehicles by 2032, which will help to bring down emissions from transport. The Scottish Government also committed to establishing a Just Transition commission to advise the Government on how to make the move towards a low-carbon economy in a fair way. This was one of our key asks during the consultation, and will help ensure the benefits of a low carbon economy are shared within Scotland. We’re still fighting for this commission to be established in law. The Bill must now pass through three stages in the Scottish Parliament before it can become law; during which time all MSPs will have the chance to debate, vote and suggest improvements to the Climate Bill. Currently (April 2019), we’re at Stage 2 of the process. The Parliament’s Environment & Climate Change committee have published a report based on evidence from a wide variety of experts and stakeholders on what more Scotland could and should do to tackle climate change. You can see reaction to this report here. MSPs then debated and backed the general principles of the Bill in Parliament. You can see the transcript of that Stage 1 debate here. Now it returns to Committee to see if MSPs want to make changes (amendments) to the Bill based on the evidence they’ve heard. This is a crucial opportunity for us to persuade MSPs to include more ambition and other changes to the Bill that will help deliver climate action in the coming years. To improve the Bill, we need to work with all parties in the Parliament. Please help us by emailing your MSP today and asking them to support stronger targets. It could be autumn 2019 before the Bill finally becomes law, and we need to keep up the pressure throughout the process. This 30 minute webinar with Caroline (FoES) and Ryan from Stop Climate Chaos explains what is going on with the Climate Bill. To win this campaign we need people power. 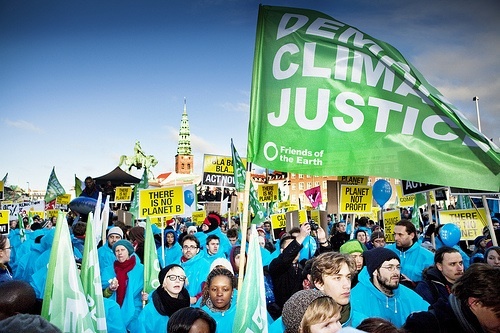 Growing movements for climate action, like the youth climate strikes, help to put pressure on our politicians to act. Together, we can make sure Scotland steps up climate action to play our part in tackling the climate crisis and build a better future for everyone. Email or visit your MSP, and tell them why you care about climate change. Join a local group campaigning for climate action.